Your customers can enjoy their favorite Oriental-style soups with the Town Food Service Chinese soup spoon. This ceramic soup spoon has a 5 in. L, 2/3 oz. capacity, is white in color and fits the look of Asian restaurants or food places that serve oriental-style soups. 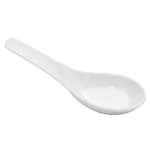 Whether you are serving Egg drop soup or some other Oriental delicacy, with the Town Food Service Chinese soup spoon, you can be prepared for whatever soups that you serve! "Wish the spoons were a little deeper. My old ones had more capacity than these new ones."